Pittcon is pleased to announce the launch of a new website for 2013 (http://www.pittcon.org) with improved navigation, overall functionality, and for quick viewing, a mobile version. Pittcon is pleased to announce the launch of a new website for 2013 (http://www.pittcon.org) with improved navigation, overall functionality, and for quick viewing, a mobile version. The web site will continue to provide relevant, up-to-date information for Pittcon conferees, exhibitors, and media representatives while offering various new, exciting enhancements. 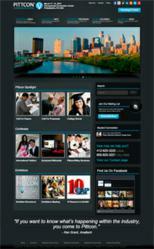 New features include better integration with social networking, intuitive navigation, and select comment areas. FSC Marketing + Digital, a Pittsburgh-based full service agency, was instrumental in creating the 2013 website. Details about the Exposition, Registration, Technical Program, Short Courses, Conferee Networking, Science Week and corresponding applications will be implemented as they become available throughout the year.